The world of films is transcending the way we educate! Education has been channelized through various mediums. The transformation over the years, has been dynamic in every scope possible. Chalks and slates have turned into tabs and styluses. No more, are the classrooms limited to the walls of schools. Theaters too, began sheltering the learners and creators. The portrayal of the education system has been distinct narratives for films and film makers. The creativity sets in when film makers add their twisted takes. Their field may cover the methods of seeking and spreading education. Films from the Indian Cinema to those of Hollywood, instances of ‘life lessons’ have penetrated via them. The world of films isn’t restricted to themes catering the curriculum of academics, only. Stories ranging from historical wars to science fiction tales, each become a book of facts. While the characters and the mise-en-scene bring those chapters alive. It as if keeps adding to our book shelves of knowledge. The films soon turn mediators of resourceful content. The narratives may differ in language. Yet, one’s way of perceiving culture broadens. By education in films, we do not limit its definition to academia only. I&We, in this blog throws light on our favorite films. Here are certain well known ones which changed our ways of interpreting the world. In terms of receiving and imparting the lessons for life. The film stars Aamir Khan and Darsheel Safary in the lead roles. The film centers around, Ishaan a 8 year old dyslexic boy. He is unable to make sense of his surroundings in the world of alphabets and numbers. The pressure of competing with other classmates of his, suffocates him. Aamir Khan as Mr. Nikumbh is seen to play a very vital role in 8 year old’s Ishaan’s life. He changes the courses for little Ishaan to understand letters and lessons in the most innovative ways. Ishaan adapts to such teachings. He paints his heart out on canvases, which is encouraged by Mr. Nikumbh. The story beautifully showcases the relationship between a student and a teacher. It puts foward the message of hope and patience. To value every student’s weaknesses and strengths is best understood by his or her teacher. The film by Amol Gupte is a treat to watch and learn from. 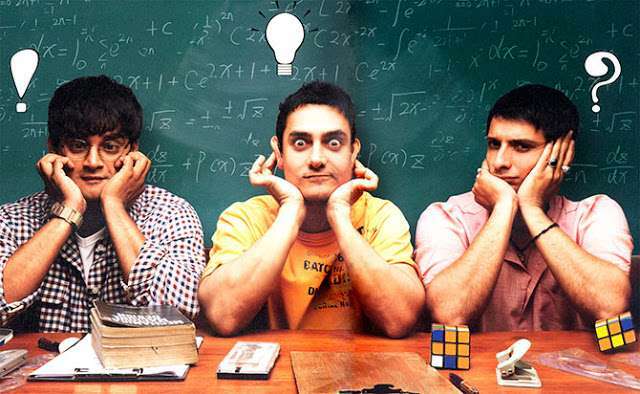 Raj Kumar Hirani’s ‘3 Idiots’ is an all time favorite. It shall continue to be so for the youth. It is loosely based on Chetan Bhagat’s novel- ‘Five Point Someone’. The film has Aamir Khan, R Madhavan and Sharman Joshi in the story’s spotlight. The film takes snippets from the life of these three engineering friends. Aamir Khan aka Ranchoddas Chanchad, is shown as the lively and carefree one among the three friends. His simple life hacks makes him everyone’s favorite. While principal, Boman Irani aka Dr. Viru Sahastrabuddhe (Virus) is the villain in the story and wants to give these three friends a reality check. While the film focuses on friendship, competition and the pressure of getting employed. The tagline ‘All is well’ fits perfectly at the end. When each of the friends are settled and doing what they always wanted to. Kareena Kapoor plays Aamir Khan’s love interest and the daughter of the principal. While Omi Vaidya aka Chatur Ramalingam is the irritating teacher’s pet and hates to be placed second. The film is a synonym to every engineering student. Acknowledging every kind of student and giving the hope of success in life’s rat race. Directed by Sidharth P Malhotra and has Rani Mukherjee as the lead. The film is an adaptation of Brad Cohen‘s autobiography ‘Front of the Class: How Tourette Syndrome Made Me the Teacher I Never Had’, This movie speaks a lot about the hurdles and in differences faced by teachers. The challenges and the passion to enrich their students with the best of knowledge, is what makes them who they are. Rani aka Naina Mathur is a teacher having Tourette Syndrome. The syndrome causes her to make sounds likened hiccups which is uncontrollable. She faces the biggest challenge of her life when class 9F, a batch of students coming from underprivileged families is assigned to her. Naina takes up the task to teach and train these students. She makes her classes and discussions more communicable. She wisely understands how the students would learn better. Hence, she moulds her methods of teaching accordingly. As a teacher she too has a competition to look our for. Mr Wadia, teacher of 9A by every means wants to scrap the classroom of 9F. But it’s a win for Ms. Mathur eventually at the end. Her batch succeeds in the examinations inspite of all the barriers. We pick ‘Dead Poets Society’ from Hollywood. For the charming portrayal of an English teacher who intends to inspire his students through poetry. The film stars Robin Williams as John Keating. He teaches a batch of boys and enlightens them on how life should be beyond the ordinary. Through lessons on poetry aspires to see his students creating their own style of writing. The creation shouldn’t be based on instructed regulations. To break free from the clutches of methodical learning is what the film talks about. This 1989 film remains a classic. It is highly recommended to watch this one. Many such films have influenced the way students and teachers think. I&We hopes to see you broaden your vision through more films. Educating yourself is a precious gift, yo your own self. 0 responses on "The world of films is transcending the way we educate!"